Its high time that Ford marketing team works harder to wake India to have a look at the New Figo free style. 6 Air bags, Traction Control, Hill Start Assist, Rain Sensing Wipers, 14 bhp more power all for 50,000 less than the Swift Zxi plus. I suppose part of it has to do with the fact that there are more and better choices for enthusiasts at slightly higher (or even parallel) price points. I, while personally a real Swift fancy and drive a Swift myself, feel that there are better options out there for enthusiasts on a budget. Now its just another entry level hatchback, albeit with a good petrol engine and reliability. Not to mention my severe disappointment that, inspite of rumours to the contrary and fervent prayers of the enthusiast community, Maruti shows no signs or interest in bringing in the Swift Sport! Exactly my thoughts here. I had been expecting this thread to light up the forum with a flutter of activity but was surprised that yesterday it was not even on the first page! I did check the car out while trying to decide my next purchase. IMHO the exterior of the car looks fabulous. I especially love the front view. It's the most comprehensive upgrade the Swift has received in India. And to me they have done it perfectly as far as the looks are concerned. It's completely new and unmistakably Swift at the same time. But interiors are BAD NEWS. The interiors are a big let down and the moment I sat inside one, I knew I would never want to buy it. The entire dashboard looks tacky, especially the center console area and while it may be an upgrade from the outgoing model, it has feels of a lot cheaper vehicle considering the quality available at this price point by other players in the market. The air-con controls and vents look way better in the platform sharing Dzire. And have never been a fan of the HU jutting out. I prefer it to be neatly integrated in the dash a-la hyundai and VW vs the protruding designs of ecosport, ignis, swift etc. Has anyone installed the original project lights available in the Z+ variant into the lower variant? Also how good is the output of the Z+ variant projectors? The output of the Zxi+ variant lights is GOOD. Its better than the lights on my vento and verna by a huge margin. Not sure of Swift and Dzire ZXi+ use the same projector setup, but i find the light inadequate in dzire especially when there is vehicle from opposite side with high beam or when its raining. Be it new Fortuner's headlamps or the new Swift's, they don't have the visibility needed for a driver [at least for me], especially when there are rains or traffic on a single lane road. The output of light [from these LED's] is a deterrent for others, but you can't see much if they don't dim their head-lamps. Will say, the XUV/Scorpio has brilliant headlamps from what I have seen, can't comment on other expensive cars/SUV's. The two use cases you've stated is a common problem and it's got nothing to do with a particular make of car. Driving against opposing high beam lights will hamper visibility because those high beams focus on you and not the road. Your eyes cannot perform optimally with lights shining into its retina. When it rains, the droplets act as a mirror and reflect your own headlights back! That's why you get the feeling like the headlamps are ineffective. Many switch to high beams thinking that's gonna be effective. To the contrary, this situation is exacerbated if you drive with high beams on. It's a physics thingy and nothing to do with your particular headlamp. There's a lot of debate on this topic but many suggest driving with only the fogs help alleviate this phenomenon to a certain extent. I've tried this myself and it kinda works. When it literally pours down, if driving in the city, I switch off my lights and drive with park lamps. On the highway, I cut down my speed to half and drive with fogs; not the best solution, but it's definitely better than driving with headlamps on. The best value package is the ZXi model. Despite the brittle plastic in the interior this is a much better car overall than the previous Swifts. I would have liked broader tyres though. A pic below of my silver Zxi after a month of driving around in it. Happened to see the below information from Maruti. Please ignore if it's already mentioned here. 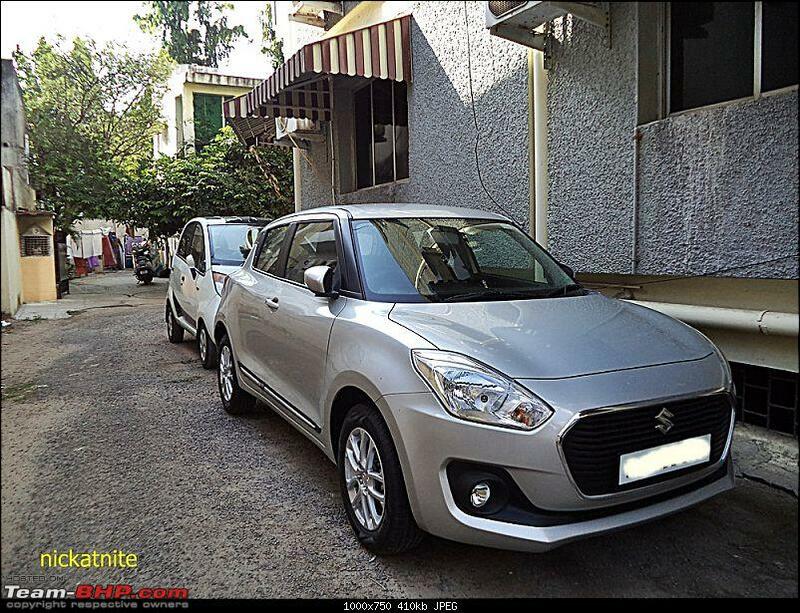 Maruti Suzuki India Limited will undertake a Service Campaign for new Swift and Baleno models to inspect for a possible fault in the brake vacuum hose. Around 52,686 new Swift and Baleno vehicles manufactured between 1st December 2017 and 16th March 2018 will be covered in this campaign. Starting 14th May 2018 owners of the vehicles included in this service campaign will be contacted by dealers for inspection and replacement of the faulty part. 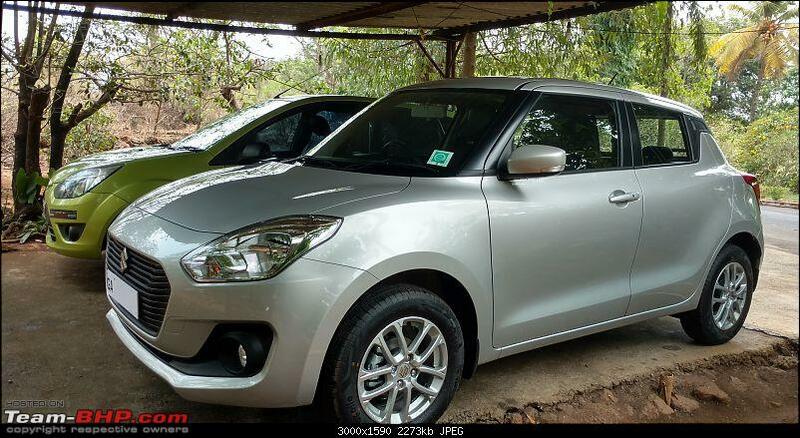 Customers of new Swift and Baleno are requested to fill in the chassis number (MBH followed by 14 digit alpha-numeric number) on the computer screen. The chassis number is embossed on the vehicle ID plate and is also in the vehicle invoice / registration documents. Picked the New swift ZXI AGS for mom a couple of days back. She needed a medium size fuel efficient Petrol automatic and the swift was the only contender as the others lost out due to various reasons like 4speed AT(Hyundai! ), cvt and bigger size( baleno), Poor service still!! (Tata Tiago). The jazz and polo were way over budget and not even looked at. Since my mom needed an Automatic we chose the swift otherwise the new Ford freestyle wold have been in our garage keeping company with our older figo. I have driven mostly for the past 150km as mom was busy so my experience has been positive for the most part with slight irritants with the gearbox. The exterior looked great to mom and okayish to me, and build quality is standard maruti, so we knew what we were in for. Hopefully maruti's stress on its new safer platform is actually safe where it matters as some accident pics online are proving otherwise. Coming to the interior i quite liked the interior design and layout, looked quite fresh to me, however the touch screen on the + model would have upped the feel. Regrading the poor dashboard materials used,it doesn't bother me much and mom definitely wont care. The Climate control switch gear and steering controls feel nice to use and are way better than the switches used in my 16 lakh plus XUV500!! Its only been 150km so i shouldn't be complaining much but i was slightly disappointed by the AMT sometimes. Especially behind slow moving traffic on an incline(hill) causes the gearbox to get confused and constantly shift between 1-2, making the driver very jerky. Also since there is no hill hold assist(not present in most cars under 10 lakhs?) you have to constantly pay attention about not rolling back in heavy traffic up a slope. Maybe the gearbox needs time to learn so i will wait for atleast the first oil change service before commenting again. Otherwise the gearbox is fine in most highway and traffic conditions with slight jerks here and there(standard AMT behavior). Comparing this gear box with my XUV AT, the Xuv's AT tends to hold the gear for longer when you need to accelerate fast while the AMT drops a gear much quicker. Since i'm in the run in period am trying to be gentle with the throttle. A picture below of our swift along with the still going strong Figo! one question, with 5 adults on board, does the car sag a lot? as owners of new swift would have driven quiet a lot, any instances of under body scrapping? From my personal experience with the new swift in petrol-- NO and NO. 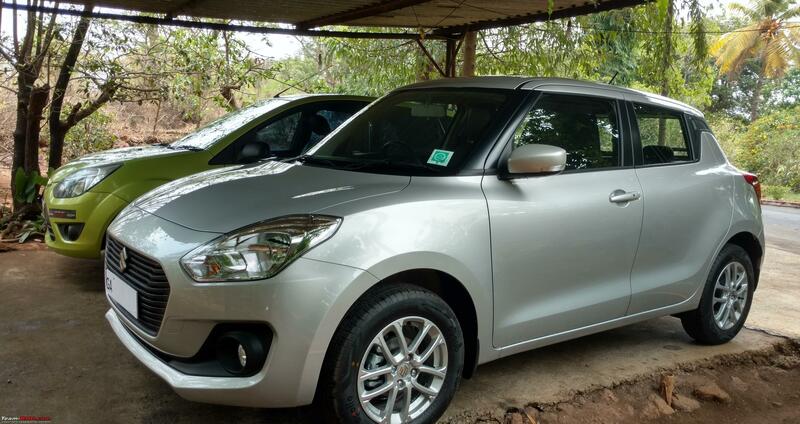 I have driven my swift (petrol) for around 1700+ kms (including highway trips). I live in Bangalore and though the ground clearance on paper, raises concern, so far I have not scrapped it on any speed breakers. In fact, the ramp to our apartments parking has a speed breaker, on which my friends ameo takes a hit, nearly every other time. However, the swift so far has not bottomed out.